As today's Nintendo Direct was mostly about the 3DS, Satoru Iwata announced a new title for the handheld that'll aim to get groups playing together. It was confirmed that a new Mario Party game is coming to the 3DS this Winter; with this being the Year of Luigi, we were also assured that Luigi would play an important role. The footage shown looked like a continuation of the classic formula that the popular series has followed for a good amount of time. You roll the dice, advance along the board and trigger a wide range of fun and wacky mini-games that rely on skill, chance, timing and various other party skills. The official spiel is that there will be seven boards, 81 new minigames to try, the option to play these games at any time and implementation of AR (augmented reality) and StreetPass. With an arrival at the end of the year we expect this to be a major part of the 3DS Holiday push. Are you looking forward to a Mario Party with fellow 3DS owners, or would you rather this was coming to Wii U? Don't think I'm all that interested in this one. I lost interest after 8. Didn't think it was very good. So long as they don't bring back that car from 9, I'll give it a shot. Hopefully they send out a demo, though. The game looks cool, hope it has wifi. Mario Party games are, in my experience, more fun on home console since you tend to play more often with friends, including casual gamers. That being said, I am still looking very much forward to this one. The new board elements seem to be a cool, slightly different approach to the tried and true formula. This one looks pretty good, probably the best looking one since Mario Party 5. Mario Party 8 had some good boards but cheap minigames, while 9 was the contrary. This one looks to have both, at least from the assortment of minigames they showed. "or would you rather this was coming to Wii U?" Awesome!!! Let the party begin! Let's not complain about how 'different' this one is this time, please? Can't wait to Party when it's released! Thisi would be way better for Wii U... Mario Party is a console game imo. MP 5 is the best one in my opinion. It had the best games, best boards, best modes...and it was the one I played with my brother and two sisters the most. Especially on our Christmas party the night before Christmas every year. Fun times...but my sisters don't care to play video games anymore. Please have online play... Don't screw this one up Nintendo. This needs to support download play. i am excited for this as I tend to play my handheld more than my console. Can`t wait to party!!!!!!!!!!!!!!!!! Huge chunk of my childhood...oh the joy! But this would've been a MUCH better fit for the Wii U, but still thank you Nintendo! This looks cool, but I have absolutely no idea why they would put a Mario Party on a handheld. Party games are played with controllers in front of a TV. That's just how they work. My purchase depends on online play...it would be foolish not to include it. Cool. I kinda expected it to come to the Wii U, but with Game & Wario, and Wii U Party coming along, I can see why this would be a 3DS installment. While my family is mostly non-gamers, a lot of them got addicted as hell to Mario Party DS when I showed it off to them, some of them even went on the lookout for cheap DS's just so we all could enjoy it. That said, I've been waiting to hear about a 3DS version! Hoping it has online play as well, that should make it mad fun, especially for those who really have nobody to play with(Mario Party games should always be played with others!). I might buy this if it has online multiplayer. I been waiting for nintendo to release the first mario party on the virtual console but this looks really good. Streetpass...I never can even use that feature...come on, Nintendo focus on online multi-player. This game would be great with online party boards and mini-games! @EaZy_T Considering Mario Party DS supported it, I think there's a good shot at download play. I just hope they don't make that as an excuse for it having no online.. If it's online I'll buy it. I really hope this one gets more than 5 over repetitive boards like the latest mario party games did. and gives more focus to the minigames! Mario Party seems like a great candidate for DLC. I'd love to see a Zelda or Pikmin board... and some cool streetpass functions. @DerpSandwich While I agree that party games are best played on one screen, handheld party games can be just as fun if they support single-card download play. Mario Party DS had fantastic multiplayer and lasted a long time for me and my friends all because of the fact that we only needed one copy of the game to fully enjoy it. 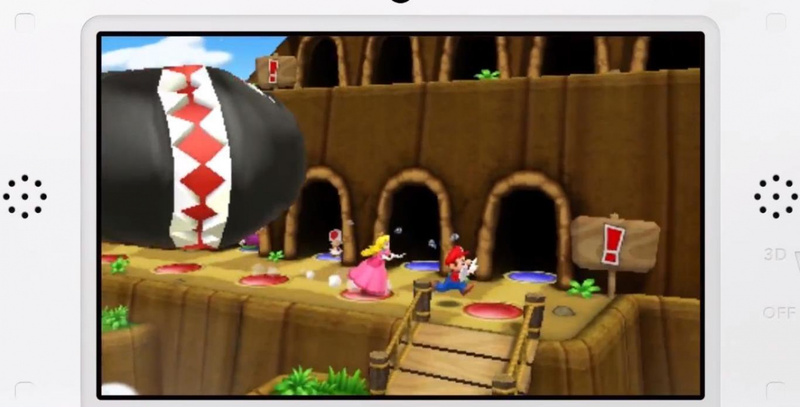 If Mario Party 3DS has download play, then I'll be excited. And when I say "if," I mean: "There's no reason that it shouldn't and I'll be upset/probably won't get it if it doesn't." And when I say that, I mean: "It had better and it better be fully-featured like Mario Party DS's multiplayer or I'm not buying it." I REALLY hope this has online multi-player. I love Mario Party, but my friends absolutely detest it. This won't be online, i can guarantee you. Anyways, online or not, I'm adding this to my list of 2013 3DS purchases left, which so far is just DKC, Pokemon, and now this. Online play is almost guranteed.. I hope it has online multi-player. If it has online play, it could pull some BIG numbers! I'll wait and see on this one. I just don't think the series lends itself to portable gaming as well as console gaming is all. It looks like one of the more interesting installments, but this needs to be online. Alright, it doesn't NEED to be, but not every one has 3DS owners around them to do single-cart and multi-cart play. I agree it's more fun to play with people around you, but multi-player centric games in this day and age essentially need to have an online function at this point. I know a lot of people are going to disagree, but I think it's worth allocating the resources for. @TotalHenshin Just imagine having a 4 player online game though...It is a wonderful idea, but having a 10 turn game will at least be 30 minutes of non stop play, which may not be convenient for some players, and they just shut down whenever they want. I also hope that they include lots of extras in the game, cause thats what led me to over 75 hours of MPDS gameplay! I love the Mario Party games but there's very few people who enjoy playing it with me (mostly because I win all the time) so I dunno if I'll get this or not. It's a huge shame because, like I said, I love these party games. AR Functions = Game not being available on the eShop? If this had online,I'd be all over this. @Meteora I understand how it CAN work, and I'm sure it can still be fun, but I just don't see why they would prefer to do it that way. I mean, the Wii U is ripe for it with the Gamepad, and it needs the games more badly at the moment! But I guess the Wii U will probably get one eventually anyway. For people wondering if Rosalina is playable, she isn't. I loved Mario Party DS. I'm sure this game will turn out great. I think Mario Party 10 for Wii U will be announced/released in 2014.
i love mario party and thise game will be allsome i like marios rainbow castil and i wued love to see it agine in thise new game. they put old tracks in mario kart games why not mario party. I liked the Mario Party game on the wii and the 3ds console, so I am excited about this one too!